Today's project is a bright, fun and festive card. The weather outside Chicago went from Spring to Winter?! We've had such a great mild winter this was bound to happen right? Well, unfortunately we all got used to the nice spring weather and want Winter to go away!!! 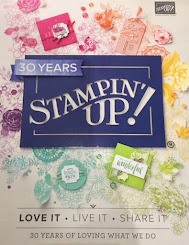 To counteract, my Winter blues I pulled out some fun paper and a GREAT stamp set! Balloon Adventures with a little Festive Birthday Designer Series paper and watercolors pencils, did the trick!